Family First Chiropractic and Wellness: Does your baby scream in the carseat? 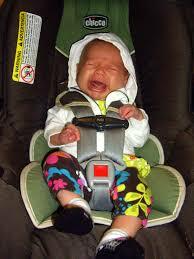 Does your baby scream in the carseat? Mothers often will bring babies in to see a pediatric chiropractor because they ‘hate' their car seats and mom is at her wit's end and has exhausted all other avenues. Mom cannot go anywhere without the baby screaming for extended periods of time and stops when the car stops. Stressful times may happen to the baby, family, and mom as she feels she is bound to stay home and cannot do even the simplest of errands. There are three areas we look at when a child has issues in the car seat. 1 Sensory overload to this child. Does the motion, vibration, or acceleration/deceleration cause vestibular issues like motion sickness or dizziness? The child may be having visual disturbances as the world whizzes by them. Spine misalignments or subluxations cause pain and irritate the nervous system when in the car seat. Often we find what chiropractors call subluxations in the upper neck, lower neck, low back and pelvis. This may be causing the child neck or back pain, numbness or discomfort when strapped into the car seat. 3. A retained active Moro Reflex. This reflex is called the startle reflex and in some children can be overactive and cause a fearful, scared, stress type of reaction. This reflex should not be active after four months and may be overactive in some infants under four months of age. 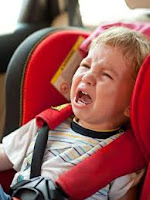 The child cannot self-sooth in the car seat causing the child to exhibit distress by screaming and crying. 1. Tummy time at least 1 hour a day- this can be broken up into 10-15 min increments. Tummy time develops the vestibular system, and nervous system and children need to have the stimulated to develop optimally. 2. Get your child's primitive reflexes assessed by a pediatric chiropractor and work with them on specific exercises for your child. 3. Get your child's spine assessed and adjusted by a pediatric chiropractor. They are experts in determining issues in your child's spine and nervous system and removing any nervous interference, enhancing your child's life. Dr. Joelle Johnson has been in practice since 1999 and completed her ICPA certification in 2001. She has many years of experience working with infants and children in Central Alberta located at Family First Chiropractic 142 Erickson Drive. www.family1stchiro.ca 403-347.3261. Follow us on Instagram, Blogger, and Facebook for information on you and your child's health. Craniosacral Therapy for the whole Family!